Southern Painter: Dragonfly Gallery, Fayetteville Tn - go see! Dragonfly Gallery, Fayetteville Tn - go see! Followers- come on the journey with me..
Would you like to purchase paintings? If you are interested in purchasing a painting, you may email at robinroberts4@gmail.com . Most paintings are at galleries (see RobinRobertsArt.com ). Paintings on this blog are just completed ( wet paint!) and unplaced and unframed. Just ask. I can make Paypal available for your selection. Enjoy! 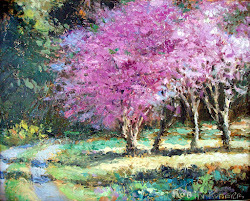 Painting Your Vision Workshop No matter what level is current in your oil painting, its time to step up to the next level. This workshop is designed to add interest in texture and design, emphasize brushwork and edges, and explore new additions to paint techniques. We do this by using traditional methods of direct or alla prima painting, which simply means all we can accomplish in a session using rich paint to make sophisticated edges. We will explore different surfaces that affect the look of an oil painting. And we will use a simple color mixing exercise to give confidence in value and mixing the color you need. Bring your references or use my photos. Demonstrations will give suggestions to add something new to your oil paintings and painting time to bring it all together.